New Jersey is known for many things, but ghosts aren't on the top of the list. We've found a place you can go to enjoy the company of a few spirits. This is not the Jersey shore. 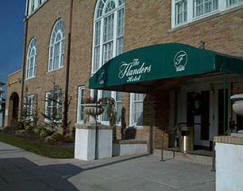 The Flanders Hotel, an Ocean City landmark, is centrally located on the famous Ocean City boardwalk and features rooms with ocean front, ocean side, bay, and city views. If also offers views of their resident ghost, The Lady in White! The Lady in White, whose real name was Emily is known to be a happy ghost who appears and disappears into walls, plays with door locks, unscrews light bulbs, and sings happily in its halls. As recent as 2002, workers and guests have reported swinging doors, locking doors, unscrewed chandelier light bulbs, and a the train of a white gown disappearing around the corner of a corridor as evidence that Emily still has fun haunting the Flanders Hotel. 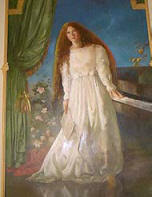 A portrait of Emily painted by artist Tony Troy based on stories and descriptions given to him by workers and guests of the hotel is featured on the second floor. The long brown-haired young woman is featured by a piano wearing a long white dress and no shoes. Her story appears near her portrait. Over recent years, The Lady in White has often been seen wandering through the Flanders by both staff members and guests. She was once seen in the basement in the early hours of July 7, 1999. She was described as being in her early twenties with long brown hair. Two earlier sightings were of a similar young woman standing near the grand piano. The sightings before that were mostly confined to The Lady in White walking barefoot through the Hall of Mirrors. On many other occasions the laughter of a young woman has been heard throughout the building.